While both teams were looking to notch their second ACC win of the season, it was the 11th ranked Florida State Seminoles (13-4, 1-3) that got off to a fast start. Florida State sprinted out to a 6-0 lead as the Pittsburgh Panthers (12-5, 2-2) tried solving the puzzle of 7’4” center Christ Koumadje. Per usual, it was Xavier Johnson who put Pitt on the board and helped steady the ship. From there, it was a back-and-forth battle as no team was able to separate by more than two possessions. The Seminoles stayed in it thanks to 18 points in the paint and 12 second-chance points off 7 offensive rebounds. On the flip side, the Panthers paraded to the free throw line with Trey McGowens (7-7) and Johnson (5-5) leading the way. Perhaps the biggest win for Pitt was playing FSU to a draw (24-22) from the 6:20 mark until the end of the half with their “death” lineup that features five guards. Despite only converting 8-23 (34.8%) field goals for the half, Pitt headed to the locker room up 36-34 thanks to their 17-20 performance from the free throw line. “They played with a lot more aggressiveness offensively than we did defensively”, was Florida State head coach Leonard Hamilton’s response to why the Panthers were able to get to the basket as much as they did and draw fouls. The second half was more of the same with neither team able to take more than a two possession lead. The Seminoles kept pounding inside, and they were rewarded for their aggressive play by getting to the charity stripe. Pitt returned serve and kept pace with free throws of their own. A McGowens triple gave his team a 49-47 lead with 11:24 remaining sparked a 12-2 run (significant in this game) in which the freshman scored 10 of those points to help give the Panthers a smidge of breathing room. An immediate 7-2 run by their opponent revealed the inexperience of Pitt as it looked like they might give the game away. Johnson would answer the call. Despite some questionable drives and decisions, his 5-0 personal run to maintain the lead more or less slammed the door on FSU. McGowens took the baton in the closing minutes to record another 30 point game. After looking a little shaky when trying to close, the Panthers looked poise in the closing minutes on route to a 75-62 victory. McGowens and Johnson were relentless attacking the basket. While the former led the team in scoring, the latter added 18 points. The duo combined to go 28-29 from the free thrown line. “We don’t play a lot of zone, but maybe I should have played zone from the very beginning”, was Hamilton’s response on how he should perhaps have handled the dribble penetration. 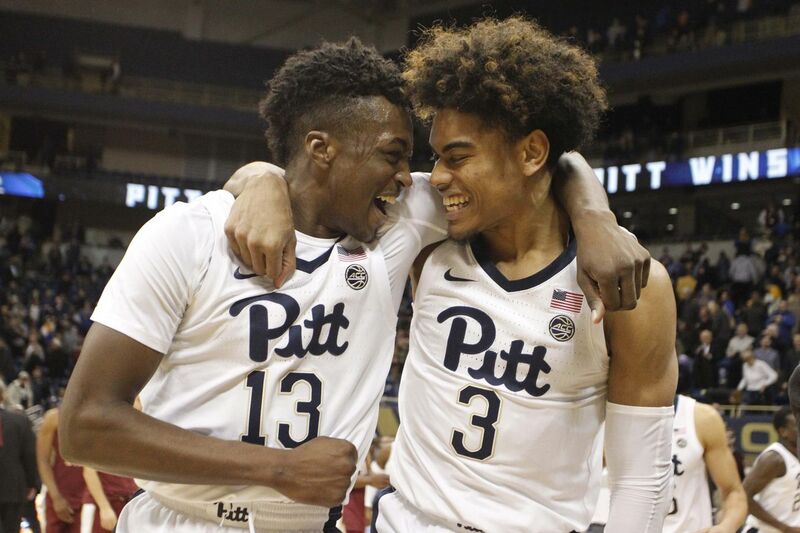 We’ll see if the Panthers are able to continue their strong play against the Syracuse Orange (12-5, 3-1) on Saturday, as they will be coming off a surprising win of their own over the Duke Blue Devils on the road.